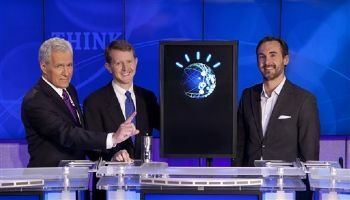 Do the best Jeopardy players in the world have any chance of beating IBM's Watson super computer? We're about to find out. For three nights beginning Monday, February 14, Jeopardy champs Ken Jennings and Brad Rutter will face off against Watson in a televised tournament. Jennings has won 74 consecutive games of Jeopardy -- more than any other contestant -- and Rutter holds the all-time earnings record with $3,255,102. But Watson draws upon research from eight top universities and is programmed to understand questions posed in natural, human language. It can run hundreds of simultaneous algorithms against its knowledge database to determine whether it's confident enough to answer. 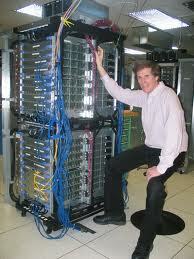 It's powered by 90 IBM Power 750 Express Servers, each with a 3.5 GHz POWER7 eight-core processor. It can account for puns and puzzles -- the kind of curveballs that Jeopardy regularly throws at its contestants. And yes, Watson answers in the form of a question. Intimidating as this may seem, Watson isn't perfect. Stephen Baker, a journalist who wrote a book about the super computer after following the project since its early development, told Mashable that Watson stumbles on questions in which the subject isn't clear (for example: "In 1984 his grandson succeeded his daughter to become his country's prime minister.) But Watson also excels at tuning out misleading clues, so when it hears "The Bat Cave in this capital of Ontario displays 3,000 life-like vinyl & wax bats in a walk-through tunnel," it quickly deduces that the answer is "Toronto." Research Staff Member at IBM’s T.J. Watson Research Center. Game shows aside, Watson has big potential for the future of finding information. Modern search engines can fail at finding answers to complicated questions, but that's exactly what makes Watson a pro at Jeopardy. In that sense, Watson has much bigger implications than IBM's Deep Blue, a computer designed specifically to play chess. The episodes that will air starting Monday were actually taped a month ago at IBM Labs in New York. All parties, including Jennings, Rutter and host Alex Trebek, have stayed silent on the outcome. You can, however, get a taste of the action by checking out some of the practice footage on YouTube. If watching Watson mop the floor with its human opponents upsets you, take heart in what Jennings told the Washington Post: "It did make me appreciate the human brain. The protein and salt and whatever... that little bit of tissue could hang in there with a billion-dollar supercomputer."